Today we'd like to talk a little bit about authenticity in wine. After all, it's what makes us tick. 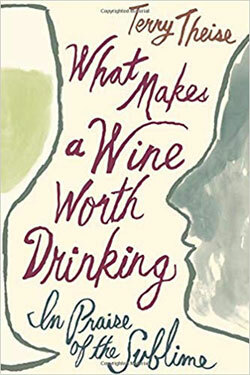 As wine writer and importer Terry Theise so deftly described it, "What makes a wine authentic? It can't be a 'consumer good' and it can't be made industrially, because then it really is a 'thing' that's just like every other thing by which consumers are induced. Authentic wine is connected to place and family, whatever that may entail." He goes on to write, "I find that the question of authenticity is the first principle; it comes before I taste and judge whether I like a wine and how much. If a wine is inauthentic, I'd rather not know it at all. It's a guy I don't wanna hang out with." "The finest wines are distinctive; they display their origins with the greatest possible clarity and detail. This glimpse of place is part of the spirit of the place, and when we let ourselves respond to that spirit, it helps us locate ourselves and our lives." These are some of the musings in the witty and thoughtful new book by Terry Theise called "What Makes a Wine Worth Drinking: In Praise of the Sublime." If you're looking for a fantastic new wine book for a winter's read in front of the fireplace (or the doctor's waiting room), then we highly recommend this one. Spoiler Alert: We'll Be Giving A Copy Of This Book Away!!! Now, just because a wine is authentic, please don't think it means it has to be expensive. Today's wine is case in point. Château de la Mulonnière is an historic wine estate in the Loire Valley producing outstanding wines since 1860, located 25 km from Angers in Beaulieu-sur-Layon, a village renowned for its dessert wine Coteaux du Layon. You won't often see us writing about Chenin Blanc. It's not really our thing and we don't take it home even though we can appreciate it. First, a little background. Chenin Blanc is a white grape variety whose origin is the Loire Valley in France (also home to Sancerre, Pouilly-Fumé and Muscadet). It's also widely grown in South Africa where it is locally known as Steen. Wine styles for Chenin Blanc range from bone dry to super sweet and everything in between, including some stellar dessert wines. If you've ever seen a sweetness scale on the back of a German Riesling bottle, it indicates the level of sweetness on a linear scale with dry on one end and sweet on the other and some kind of marker in between to indicate the sweetness level of the wine. Rieslings can be confusing due to the fact they can also range from bone dry to super sweet so this scale is a way to help you visually understand what's in the bottle. If you applied that same scale to this wine, the marker would be just past the halfway point. In other words, there is really great fruit and a gentle sweetness (along with nice acidity), which makes it a perfect pairing for spicy dishes (think Thai, spicy Asian, BBQ). Handy Tip: sweetness always modifies and tempers spiciness, whether it's in cooking or in wine. Back to today's rocking white wine. $14.99/bottle or just $143.90/12 pack case ($11.99/bottle) or just $11.99/bottle in a mixed case of wine. If you enjoy spicy food, this is your new favorite wine. If you enjoy the subtlety of Riesling, this is a fantastic new offering for you. Try something fresh and exciting like this wine and expand your wine horizons. We're sure glad we did! As of right now, there are only 18 cases of this wine remaining in the state. 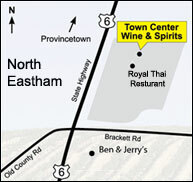 Please call the store (508 255 3660) and ask to speak to the Manager Jeff, or respond to this email to reserve your wine. Now through the month of February, submit your picture of one of our weekly wines along with a food pairing to info@towncenterwine.com and we'll select a winner to receive a free copy of Terry Theise's fantastic new book! We'll also feature your photograph in our email the first week of March.